Partying it up with peaches today, y’all. Get ready. So peaches. Peaches everywhere! In all the things. Literally at every corner of the internet. They are my life right now. Obviously with zucchini coming in close second. I mean really, guys. is there ANYTHING better than biting into a sweet juicy peach on a hot, muggy August day? 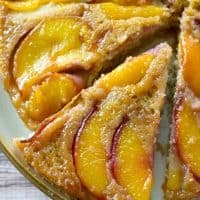 Is there ANYTHING better than a warm caramely peach upside down cake cleverly disguised as coffee cake? Except possibly another slice. Or 5. Here’s the deal, friends: this coffee cake is pretty much the real DEAL of summer produce eatin’ done RIGHT. FYI: August is just too short a month for me to squeeze in all the summer stuff I still want to eat. Now hiring duplicate Sarahs to help eat all the summer goodness. Peach season actually kind of snuck up on me this year as I not-so-casually posted my second peach recipe of the season last Friday. I’ve totally been eating them for weeks on end, make no mistake about that, but as far as throwing them in recipes? I’ve been slacking. So in return, I shall offer you a priceless peace offering of peach coffee cake. Say that five times fast. I could but to be honest, I’d much rather be EATING this coffee cake 5 times fast. It kinda blows my mind in a million and one pieces to even fathom this, but I’ll say it any way. It starts with H and end with “ealthy.” Get it?? This coffee cake is, in fact on the lighter side. Less butter, more whole wheat, oh and obv so much ultra-healthy peach goodness. This all equals complete and total “eat every dang crumb of me, I’m HEALTHY” coffee cake. So much yeahhhh feely-feels towards all this heaven right now. It’s makin’ this girl’s Monday, without a doubt. I really am just crushing on every little thing about this coffee cake. The gooey caramely peach topping. The ultra-moist, melt-your-mouth cake. That satisfying and nostalgic feeling of SUMMER that washes over you with every luscious bite you take. And I seriously just made everything rhyme up there without even trying. Woot! I am on a peach-perfect roll today. Can you feel all the love of glorious peaches pouring out of this beaut-acious cake that really is more or less fit for a queen? We’re ALL queens in peach land, friends. So I really think we should all be diving into this peachy paradise uh, NOW? You can’t even tell me that that graceful gesture wouldn’t make your Monday. Make the cake: In a medium bowl, whisk flour, baking powder, salt, and cinnamon. In a separate medium bowl, beat butter and sugar until creamy. Beat in yogurt, eggs, milk, and vanilla until smooth. Fold flour mixture into liquid until just combined. Coffee cake is best if eaten on the same day it is made. Go forth and go cray with the peaches, my friends. Oh this cake is just gorgeous, Sarah! Peach anything is my favorite, but when it comes to cakes, its my weakness. 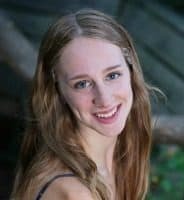 I loe this upside down version, Sarah! So perfect to go with my morning cup of coffee! This cake is fabulous, Sarah! Upside down cakes are so simple and rustic, making them that much more enticing. This peach version just might be my favorite! Oh mi gosh, I love this idea. The dessert turned out so beautiful!! Sarah, this cake is absolutely gorgeous! I love upside down cakes! Oooh, I love how juicy those peaches look! I bet this is loaded with flavor! I adore upside down cakes, they are simply the best! This looks sensational, send me a HUGE slice pleasE?!!! Aww thank you Manali! Totally wish I could send you a piece! 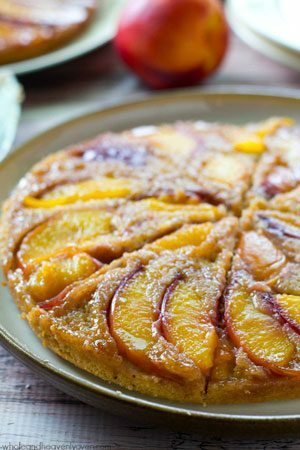 I love upside down cakes – yours looks perfect 🙂 We can’t get enough of peaches right now and this is the perfect way to use some up! There is nothing better than biting into a peach! I love peach season! And it comes and goes so quickly so I tend to eat my weight in them when they’re in season, obvi, lol. This upside-down cake is awesome! I love the peach addition! I just got done hoarding the BEST peaches from the farmer’s market. Needless to say I’ve got peaches on the brain! Sarah I need this upside down coffee cake in my life ASAP. What a perfect brunch recipe! Haha glad to hear that I’m not the only one who “peach hoards.” LOL. Thanks Alyssa!! Sarah you always put a smile on my face! Can’t wait to make this! I LOVE peaches…& coffee cake! You’re too sweet, Carla! Thanks for the kind words! I bought a lug of Colorado peaches yesterday. I’m getting up and out of bed to make this now. Lol yup at 6am on my day off! i dont know why its call coffee cake . ther havnt coffee in ingredient .. This looks delicious! I am going to make it. I just finished typing out the recipe and noticed under the cake recipe it just said 3/4 coconut sugar or brown sugar. Was it suppose to be 3/4 CUP there, or Tbsp? Thanks can’t wait to make it. So sorry for that typo, Joan! Yes, the correct amount is 3/4 cup of coconut sugar. Thanks for catching that! Can you possibly give me the caloric content for each slice? I love that it has coconut sugar and also yogurt…that makes it lighter. Best regards from Panamá! Do you have any nutrition information on this cake, other than its healthy. I have to watch my carbs and I could see this cake being high in carbs, but it looks so yummy! Peaches are my second favorite fruit (strawberry is first). Hi Terry! You can find out the nutritional info for this cake using this website! Did you ever try this recipe in a 9 X 13 inch pan? Going to try and line the pan with parchment so it will invert to a dish easier – Thanks for sharing your recipe! I haven’t tried this one in a 9×13, however you can certainly try it! You may have to bake it a little bit longer though. Hi Sarah, if I substitute the white whole wheat flour for regular white flour (the unhealthy option 🙂 ) would I use the same amount? Hey MacKenzie! You may have to use a little additional flour. Just make sure the batter is slightly thick and smooth. Can you use frozen peaches for this recipe? Yes, you sure can! Just make sure they’re thawed. Can you use canned peaches? If so, do i need to make sure the juice is totally drained off or not? Yes, you can use canned peaches, but make sure that they are completely drained. Good luck, Robin! This came out really good, thanks a lot Terry 🙂 It’s a keeper. Have a few peaches left & want to make this recipe. One question though, could I use plain GREEK yogurt, it is what I have? Thank you! Yes, plain greek yogurt would work fine! Thought it would be too much so I cut the recipe in half but added more peaches. Also used a bit of sour cream as I had no yogurt. It’s quite nice…not too sweet at all. However, I would definitely go for the whole recipe next time. Highly recommend.